Count Whole Foods and General Mills’ Cascadian Farms as the latest champions of the challenged honeybees. To raise awareness, Whole Foods stores are busy talking up the powers of pollinator with “Human Bee-In” events and “Give Bees A Chance” promotions. 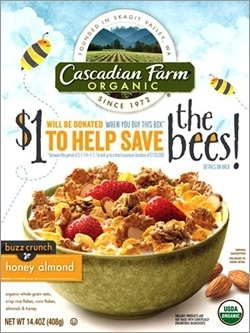 And General Mills, which launched Buzz Crunch Honey Almond cereal exclusively at Whole Foods Market stores nationwide back in April, says it is now donating $1 for every box sold, up to $100,000 to the The Xerces Society, an Oregon-based nonprofit and leader in pollinator conservation. Whole Foods and Xerces say they will continue to share the buzz through July 1, raising awareness of the role bees play in food supply through a social media campaign. The plight of the honey bee, a problem that has been baffling conservationists and farmers for almost a decade, gained additional attention last week, when President Barack Obama announced a task force to address the issue of rapidly diminishing honey bees and other pollinators. "Pollination is integral to food security in the U.S.," the announcement says, with pollinators, which also include vanishing Monarch butterflies and threatened species of bumblebees, affecting 90 commercially grown crops in North America, and adding some $24 billion to the U.S. economy. Honey bees account for $15 billion, and the number of managed honey bee colonies has fallen from 6 million hives in 1947 to 2.5 million today. Obama's budget recommends $50 million to encourage research. In years past, Whole Foods has dramatized the bee’s plight by erasing produce items from its shelves. This year, its Lynnfield, Mass., store turned the attention to the dairy aisle, taking away many products for a day to demonstrate how important bees and butterflies are to dairy farmers. The Austin, Tex.-based retailer is also donating $1 for every organic cantaloupe sold to The Xerces Society, and many participating brands are donning “Give Bees A Chance” signs, making with-purchase donations to Xerces, including Annie’s; Barney Butter; Burt’s Bees; Celestial Seasonings, and Luna.